This month we’ll be covering the third and final part of this three-part series, which to date has covered the Competitive Titles and About the Author components of the book proposal. With these two aspects behind us, we can now turn to “Marketing/Publicity,” arguably the most time-consuming and elusive part of the proposal. Marketing/Publicity, as I’m referring to it throughout this post, is a component of your book proposal, and it requires you to get comfortable using a little smoke and mirrors. I’m not suggesting that you lie, but I am absolutely suggesting that you’re not required to deliver on everything you include in your Marketing/Publicity plan. This section of your proposal exists as a marketing tool, and its sole purpose is to make a case to your would-be agent or editor that you understand how to reach your readers. This is not the place to make a case for the fact that there’s an audience. You do that in another section of the proposal called “Target Audience.” This is the place to talk about where your readers hang out. It’s the place to make long lists of TV shows, radio stations, and magazines that might want to feature your work. If you have connections to any particular outlets, that’s wonderful, but again, it’s not required. The point of this section is to show the person reading the proposal that you get that you have to cast your net wide, and the more information you can pack in there, the better. 1. Statistics: Use stats wherever possible to talk about your target demographic. Remember, it’s important to differentiate the Marketing/Publicity section from the Target Audience section. Here you’re using stats to say things like, “14% of family caregivers care for a special needs child—an estimated 16.8 million care for special needs children under 18 years old (National Alliance for Caregiving/AARP, 2009)” or “According to a 2005 article by Pew Internet & American Life Project, some 55% of adult internet users have looked for “how-to,” “do-it-yourself,” or repair information online, and roughly 1 in 20 internet users—about 7 million people—search for repair help on a typical day.” These are called “marketing points” in the industry because they make the case that there are real numbers to support your claim that there are people out there who will want to read your book. You might wonder about the point of including this kind of research in your proposal, but again, it’s a marketing tool. Agents and editors need all the ammunition they can get to make a case for your book. 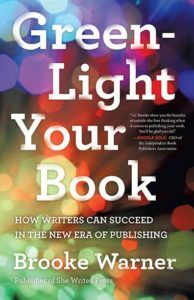 Agents are selling to editors and editors are selling to their Editorial Boards and ultimately to the reps who in turn sell your book to book-buyers who sell your book to consumers. The more robust your Marketing/Publicity section, the better equipped your agent or editor will be to make the case that you’re worth taking a risk on. 3. Your personal marketing plans and/or connections: The Marketing/Publicity section is also the place where you drive home any and all ideas, plans, connections, and favors you might be able and willing to pull. This may include possible speaking engagements even if they’re not yet booked. You could say you’ll approach your local JCC, for instance, even if they haven’t formally invited you to speak. As long as it’s true, you can say that you have a connection to Julia Roberts and that she may blurb your book. This is where the smoke and mirrors part comes in. You’re not necessarily having to deliver on all the things you propose, but you’re putting forth all of the things you think you can do. Don’t say you’re going to start a blog if you have no intention to do so, but do say that you’ll blog every day if you’re willing to, even if you’re not currently blogging every day. The Marketing/Publicity section of your book proposal is meant to show the ways in which you’re thinking big—bigger than you might be feeling even. It shows that you’re thinking outside of the box and that when push comes to shove you’ll step up to the plate and be a strong collaborator who’s willing to go the distance to help your publisher sell books. Publishers are increasingly relying on their authors to bring the readers, and understanding this as you’re creating your Marketing/Publicity section is key. You honestly can’t go too big. And this is intimidating to a lot of folks. I’ve seen more than a few authors balk at the idea of having to sell themselves in this way. But trust me, it’s worth it. Put in the time to create a solid presentation. Hire someone to do the research if you need to. Putting forward a flimsy Marketing/Publicity section gives agents and editors a good reason to pass on your project. And giving it all you’ve got can make the difference between getting representation and a book deal and being left wondering why you got a rejection. What Exactly Am I Writing? Excellent post! Thank you for 1. The motivation and 2. Directions on how to implement that motivation! Bravo.